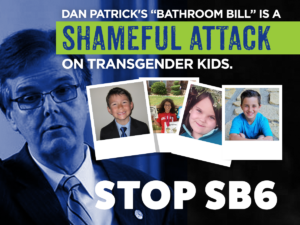 The Senate Committee on State Affairs will hear witness testimony on SB6, also known as the “bathroom bill” on Tuesday, March 7th, starting at 8:00 a.m. in the Capitol Extension E1. 036. There are many ways to voice your opposition to SB6. Two important ways to are through social media and through testimony at the public hearing. For social media, we ask throughout the day that you use #StopSB6 and #YallMeansAll when posting to Facebook, Twitter, or any other social media app in order to create more advocacy noise. Public testimony requires registration; please read these introductions for more information. Know the who and where for committee hearings. The SB hearing is with the Senate State Affairs Committee. The hearing begins at 8 a.m. in the Capitol Extension Room E1.036. The room will open at 7:30 a.m. Registration will open between 7:15 a.m. and 7:30 a.m. The Capitol opens at 7:00 a.m. At registration, those registering to give oral testimony will be assigned a panel number. Witnesses will be called up by panels. Outside the hearing room and “holding room” there will be dry erase boards with the panel numbers inside that room. (For example, witness panels 1, 2, and 3 will be in the hearing room. Witness panels 4, 5, and 6 will be in the “holding room”. Room E1.028 will be used as the “holding room” for the next panels testifying. Rooms E1.012 and E1.016 will be overflow rooms where the hearing will be streamed. Bring a smartphone or wifi-enabled device, charged. You may be able to register using a wifi-enabled device, so bring a fully-charged device the day of and portable chargers if you have them. Questions. If you have questions on the day of the hearing, look for someone in a gray T-shirt with a name tag saying “Equality Coalition Staffer”. There will be a hospitality room E2.1006 (next to the House Member’s Lounge) with staffers, extra T-shirts for supporters, and refreshments throughout the day. At 4:30 p.m., we will also have access to the House Member’s Lounge. You can text “SB6” to 97779 for updates throughout the day. Parking. Free 2-hour parking can be found in the Capitol’s visitors parking garage on 13th and San Jacinto. Street parking and other garages are around the Capitol. Registering at kiosks. SPECIFIC RULES FOR THIS HEARING: Anyone wishing to provide oral testimony must fill out a paper witness card. Electronic registration will only be used for people wishing to register a position on SB6 and people submitting written testimony only. Several kiosks for registering can be found near the hearing floor and around the Capitol. When registering, these devices will prompt you to provide basic information such as name and address, what entity you’re representing (either yourself or an organization), your position on the bill (oppose SB6), and whether you plan to testify or only submit a written testimony. Representatives from Equality Texas will be there the day of to help you find these kiosks, however, kiosks can also be found using Capitol maps. For a more extensive guide, check out this video. Written testimony from people not present. The Committee Clerk advises that written testimony from people not present at the hearing can be submitted to the Committee Clerk’s office. The office will distribute to committee members. Equality Texas is happy to accumulate all such written testimony and deliver it to the Clerk’s office. Sign a Testimony Card. SPECIFIC RULES FOR THIS HEARING: Anyone wishing to provide oral testimony must fill out a paper witness card. You can also provide the same registration information through testimony cards that can be found on a table near the entrance of the hearing room. These cards can be submitted to the clerk at anytime. Wear Purple! In order to let the committee members and those in attendance to see and easily spot our supporters we ask that everyone wear purple in solidarity with the transgender community. Media Event. Come to the #StopSB6 press event at 11:30 a.m. on Tuesday. The event is planned for the outdoor rotunda in the Capitol Extension, near the hearing room. You can bring signs and provide support as press conference speakers explain to reporters why SB6 is disriminatory and why we must #StopSB6. Testifying is not required. If you only want to register in opposition to the bill, that is all you need to do. Testifying is an option for every citizen that wants to speak before the committee. Limit testimony to 2 minutes. Testimonies will be timed and you will be allowed 2 minutes to complete your entire testimony. Utilize your time well and practice what you want to say beforehand. Remember that most testimonies are more conversational rather than academic. The key message is that SB6 is discrimination. Don’t be deterred. The hearing will start with the author of the bill, Sen. Kolkhorst, explaining her bill. This will be followed by questions for the author from committee members. Next, the committee will hear testimony from “invited” witnesses. These “invited” witnesses will all be supporters of SB6, and will be some of the most vile and offensive anti-LGBT lobbyists in the state. It may be an hour of more before the committee begins to hear public testimony. Committee members may interrupt you to ask questions. If so, simply answer their questions to the best of your ability and keep pressing forward. If you did not get through your entire testimony, a written testimony, if supplied, can be archived in full. The Committee will adjourn when the full Senate is scheduled to convene. The hearing will than resume once the full Senate adjourns for the day. The hearing will likely extend into the evening. Back up statistical data. Any statistical data provided is strengthened by supplying the company or agency that led the research. Make sure to cite your sources. Thank you for contributing to the fight for equality for all Texans. Please don’t forget to use #StopSB6 and #YallMeansAll when posting to Facebook, Twitter, or any other social media app!